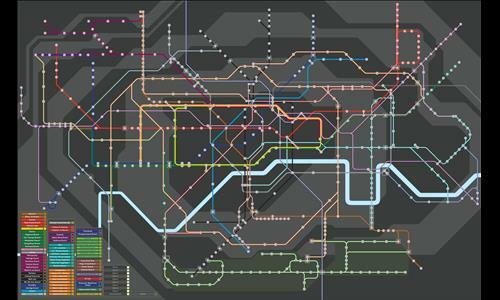 A map of how the London Underground and related services may look, but most likely will never look, in the future. A bit different for WarLight, this map consists largely of bonuses that cannot be independently controlled, each one held directly impacts one or more other bonuses. Conflict for control is essential to how this map plays. Bonuses are based on real services, mostly, though it's not entirely accurate especially for smaller branch lines and the District line. Strategies that work on 'normal' maps likely won't be as effective here. Custom designed and based on a design originally created in 1931 by Harry Beck. Future services from Wikipedia and other sources. Review by MainstreaM on 11/22/2012. It would be fun to have bigger bases - in the beginning it's really hard to see where all your units are and who can attack them. Thanks for considering that, and... 5 stars!!! This is being considered as I am starting work on other maps and your input is invaluable. Glad you like it! There are some limitations on a map of this scale in Warlight, it works pretty well but certain things like the size of the numbers and the ability to scroll around whilst a bonus is highlighted are less than ideal. That's the main reason the map is dark, to help the magenta glow be more visible. I do plan on somewhat larger bases, but that will have to wait for a more major redesign (there are a few future lines I'm wanting to add in as well to address certain pinch points). I'm curious, for you and future reviewers, do you have local knowledge, and do you find that it influences the gameplay if you play someone who isn't matched in local knowledge (ie. has much more or less than you) ? Bonuses are difficult to understand sometimes but otherwise very enjoyable. Review by PJABBER on 12/7/2013. Interesting game but requires dedication to play and quite a bit of time as well. Review by Greavyard on 7/24/2013. The map itself is great, I played with 3, nut i think its better to play with more then that e.e, but the numbers are somewhat hard to see. Review by RvW on 6/23/2013. Most of the bonuses on this map are not likely to be ever completed; by the time you have them it has long since been obvious who is going to win. So, I suggest the "extra armies for territories" setting to help people get some additional income. That having been said, pay close attention to short lines and the "branch" bonuses; some of those can be obtained relatively easily! While battling for long "straight" sections can get rather boring, there are certainly interesting areas on this map. Especially when fighting near the centre, make sure to pay close attention to which stations connects where, because some connections are easy to overlook (for instance, I often forget about King's Cross <--> Russell Square). I think the additional lines make this version more fun to play than the other London Underground map, but I think the other map has a better bonus system. Play them both a few times and see for yourself which you like best! Review by AdeptStrategist on 3/9/2013. I like the idea, but I think that the creator has a lot to work on in implementation, the number of units gained per bonus is too few, bonuses themselves are too exposed and unbalanced, there are strings of territories not in bonuses, and no real patterns to the bonuses. Review by Nathan on 5/14/2015. The map is very attractively done, but like most train line maps, it gets very tedious after a while. Not only is the layout almost entirely linear, but most bonuses consist of an entire branch or main line of track, meaning you have something like a 17-territory bonus in single-file order. Needless to say, incomes will be very low on this map. Gameplay would be significantly improved by offering smaller bonus regions, or perhaps by playing with the armies/territory income feature turned on. Alternatively, larger stations could be made worth 1-2 bonus armies by themselves. In any event, the map is beautiful but not all that playable. Also, the connection between Stratford International and King's Cross could be drawn more boldly. Review by Andalorium on 8/17/2016. Review by andrisk1 on 11/23/2012. 2 out of 13 people found this review helpful.